SIOUX FALLS, S.D. - For the week ending Sunday, there were 1.9 days suitable for fieldwork, according to the USDA's National Agricultural Statistics Service. Topsoil moisture supplies rated 6 percent very short, 13 short, 71 adequate, and 10 surplus. Subsoil moisture supplies rated 11 percent very short, 27 short, 57 adequate, and 5 surplus. 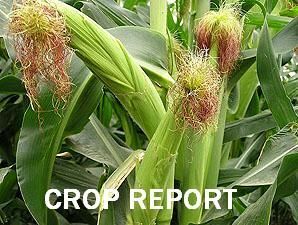 Corn condition rated 5 percent very poor, 12 poor, 19 fair, 44 good, and 20 excellent. Corn mature was 89 percent, well ahead of 69 last year, and ahead of 79 for the five-year average. Harvested was 16 percent, ahead of 6 last year, and near 13 average. Soybean condition rated 6 percent very poor, 8 poor, 22 fair, 49 good, and 15 excellent. Soybeans dropping leaves was 95 percent, near 96 both last year and average. Harvested was 28 percent, ahead of 20 last year, but behind 41 average. Sorghum condition rated 1 percent very poor, 5 poor, 26 fair, 67 good, and 1 excellent. Sorghum coloring was 92 percent, near 96 last year, and behind 98 average. Mature was 45 percent, near 49 last year, and well behind 67 average. Harvested was 16 percent, ahead of 3 last year, but near 18 average. Sunflowers harvested was 4 percent, behind 9 last year, and near 7 average. Winter wheat planted was 74 percent, near 76 last year, and behind 79 average. Emerged was 49 percent, near 46 last year, and ahead of 39 average. Pasture and range conditions rated 12 percent very poor, 15 poor, 28 fair, 42 good, and 3 excellent.